For the last few days, our intrepid satellite navigation unit has been having difficulty waking up in the morning. Humans can be forgiven for that sort of thing; computers cannot. The problem is that it will not acquire satellites until you inform it that you have moved hundreds of miles since you used it last, at which point it eventually comes to life as if nothing has happened. We had decided to start the morning with a quick trip to Walmart, only a few minutes away from our hotel, so after being turned on the little computer was dumped unceremoniously in the glove compartment to wake up properly. Imagine our surprise, therefore, when out of the depths came a disembodied electronic voice; continue five point four miles. One can only speculate as to how many satellites can be found within the depths of a Pontiac Grand Prix. Regular readers of this site could be forgiven for thinking that my writings only chronicle the inadequacies of places that I visit, rather than the many positives. It is with absolute delight therefore that I can say that the only negative thing that springs to mind about this park is its location, a few miles away from Des Moines, or in better terms, more than four thousand miles from my home. And yes, that is pretty selfish of me! 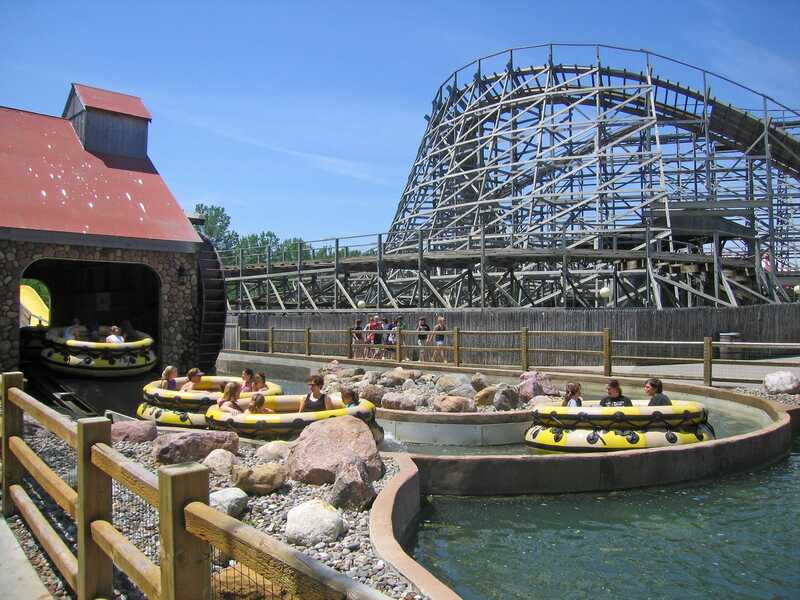 Adventureland Iowa has an absolutely lovely atmosphere, second only to Holiday World for sheer friendliness. Unlike Holiday World, however, the environment here has come out of a rather unusual recruitment policy; fewer than ten of the staff we saw were below retirement age. All were nonetheless bright and enthusiastic, far more so than the usual bored robots seen in other parks around the world. A few days ago we visited Mount Olympus Theme Park, which seemed to be staffed entirely by Bulgarian students. Here, however, we'd found the other extreme, and very nice it was too. Underground (#736) is probably the slowest coaster on the planet. In fact, were it not for the three lift hills one might have difficulty realising it was a coaster at all. It could instead be considered to be a dark ride powered by gravity. The train is very long indeed, but there was no noticeable difference between front and back, which is a testament to how fast the ride doesn't get. The scenes therein were varied and eclectic. Some had a mining theme, but others looked like they had been borrowed from haunted houses. It was certainly an interesting way to pass a few minutes, although even now as I write this up I'm not entirely sure what I experienced. 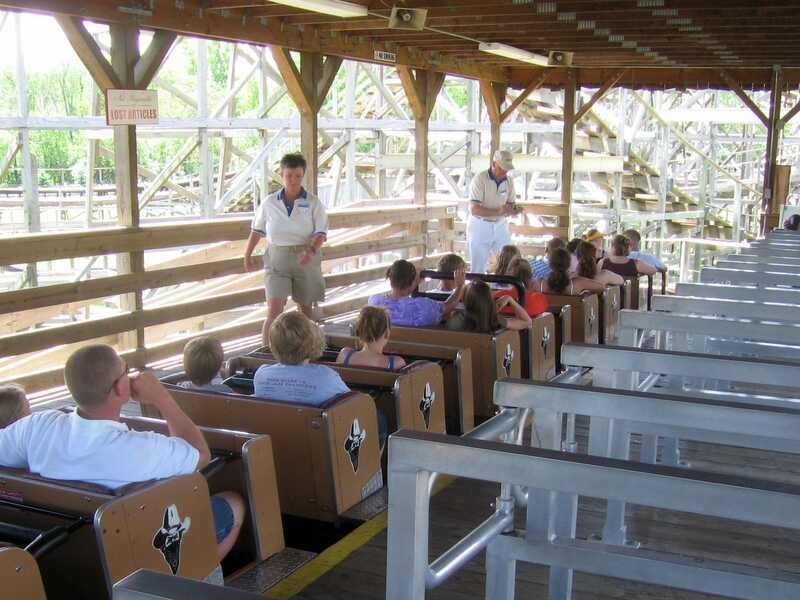 The park first installed a wooden coaster in 1978, and that ride remains today. Tornado (#737) has been well looked after over the years, and though it does shudder a bit it is still fun to ride. It is certainly leagues ahead of the steel coaster found next to it, Dragon (#738), which had square wheels that only followed the track in the broadest sense of the word. The ride experience had very little to recommend it, although some of the younger patrons seemed happy enough to ride repeatedly for reasons best known to themselves. With that done we ticked off our final credit on Outlaw (#739), which can only be described as superb. Though not particularly tall, the ride managed to demonstrate in fine style the furious intensity that CCI rides are known for; we ended up riding three times. One of my favourite water rides is the spinning rapids concept. Sawmill Splash was probably the smallest example of the genre I've seen in my travels, but great fun nevertheless. Unfortunately the loading speed today was pretty slow, resulting in three boats waiting outside the station pretty much continuously. My guess is that there was a lift motor problem as only one boat was allowed onto the lift at a time. The operations of food outlets do not normally feature in these pages. It is worth breaking that unwritten rule, however, to chronicle one of the most intelligent ordering systems I have ever seen in a sandwich store. Consumers here were being given an order form to fill in; one just needed to tick the boxes for the components required. This was a nice idea, and one that completely eliminated the problem apparent in such stores where the staff have difficulty understanding foreign accents (or indeed local ones!). Having eaten lunch neither of us felt like any additional coaster riding, so we decided to call it a day. Before leaving, however, we tried the two observation rides, a Ferris Wheel and a Sky Ride, both of which provided good photograph angles. Given its location, well off the beaten track, it is hard to know if I'll ever be back in Adventureland again. However, given my memories of the place from just one visit, I will definitely make the effort if I'm within a two hundred mile radius. The staff and management of this park should be proud; many other parks around the world could learn a lot from them. We were not actually planning to visit Worlds of Fun today; rather, it had been planned for tomorrow. However, due to a shorter than expected time in Adventureland Iowa we arrived in the Kansas, MO area with three hours before park closing. Rather than hang around a hotel, we decided to enter the park, thereby freeing up Thursday for a totally insane plan. But that's for tomorrow's trip report! Worlds of Fun proved a rapid crash back to earth after the wonderful morning in Adventureland Iowa. We were clearly back in a corporate park with all the usual nonsensical rules, long drawn out announcements, and uninterested employees. The weather was rapidly degenerating, so we decided to go directly to the coasters we hadn't ridden, just in case conditions should close them down. 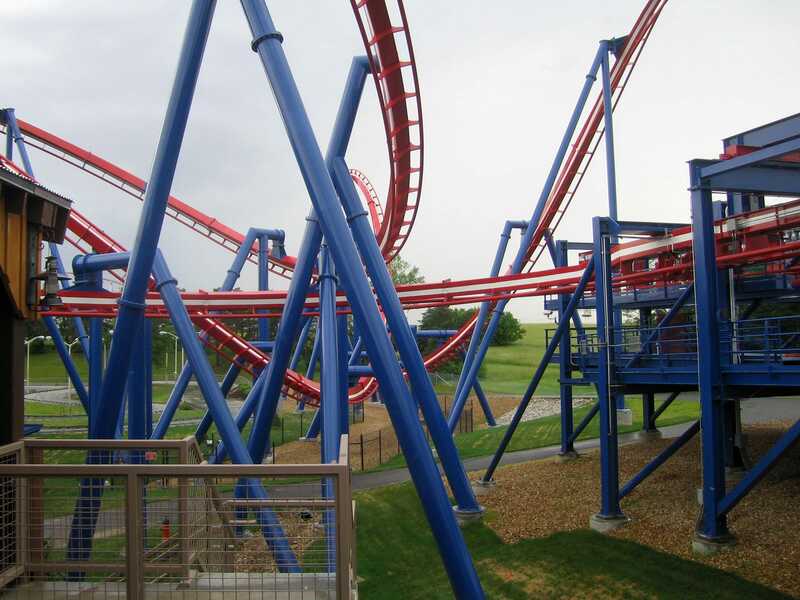 The first visible attraction was the new ride for this year, the Patriot (#740). As befits a coaster with that name, the speakers in the queue were blaring out a rendition of the expected national anthem at full power, marred only by some nasty distortion from one of the speakers. The ride showed all the characteristics B&M rides are known for, and certainly qualifies as my favourite new steel coaster for this year to date. The only other essential tick was Spinning Dragons (#741), a carbon copy of the ride ridden yesterday at the Mall of America. This one, unfortunately, appeared to be experiencing some form of technical difficulty (though the exact problem may have been disinterested staff). Whatever it was, only one car was being let out on the course at any given time, which didn't help capacity much. The ride was still great fun, though it would probably have been better if we hadn't had to wait half an hour for thirty people in front of us to clear through the ride.